Tribal life is something, which always fascinates the modern man. Sand Pebbles’ Odisha Chhattisgarh Tribal Tour will let you explore the different tribes of Odisha and Chhattisgarh with its special packages. The most primitive tribes of Odisha and Chhattisgarh are Dunguria Kondh Tribes, colourful Bonda Tribes and Gadaba, Maria and Maria Tribes, Gond Tribes who still live in high hill and have preserved their culture and traditions intact till today. Odisha Chhattisgarh Tribal Tour will let you experience the essence of different tribes. The plethora of wonderful places in here remains unexplored that offer delightful experience. Tribes in Odisha and Chhattisgarh occupies a unique position in the tribal Ethnographic map of India for having the largest variety of tribal communities. With our special Odisha Chhattisgarh Tribal Tour package one can discover the traditions, cultures, ethnic cuisines and handicrafts. 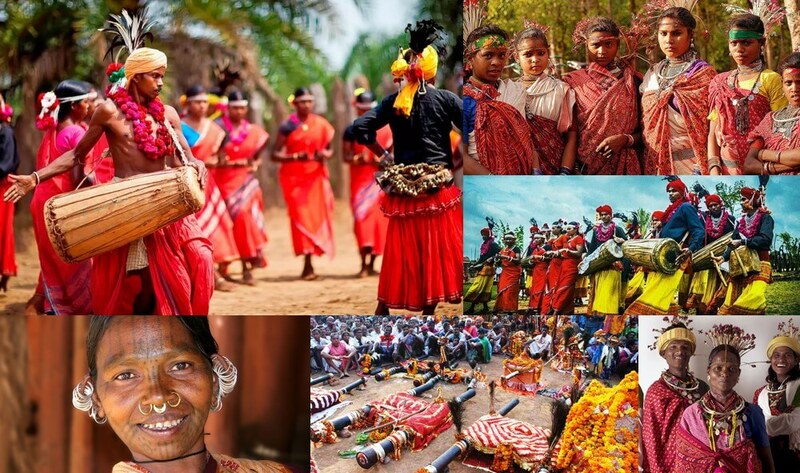 Odisha Chhattisgarh Tribal Tour invites you to experience the amazing tribal life of India. Upon arrival at Visakhapatnam airport transfer to Jeypore on the way visiting few tribal villages, Jagannath temple in Koraput Town and in the evening visit of Jeypore town. Overnight at Jeypore. The morning after breakfast visit to Onukudelli to visit the most primitive tribe called Bonda, Gadaba & Didayee in the weekly market. Then visit few villages of Gadaba tribes and then leave for Jagdalpur. Overnight at Jagdalpur. After breakfast visit of Kanger Valley National Park and Tirathgarh Waterfall. Then in the afternoon visit of Chitrakoot waterfall (replica of Niagara Waterfall). Overnight at Jagdalpur. After breakfast leave for Kanker visiting Kondagaon (famous for dhokra casting) and Kideichapra (famous for ironwork village). Overnight at Kanker. After breakfast, enjoy a full-day excursion to visit the tribal village of Bahaigaon, which is famous for its dancers. The countryside around Kanker is an endless series of interesting discoveries. Visiting the Gond Muria and Gond Halva tribal villages can be a fascinating experience for you. In the evening, we return to Kanker. Overnight stay will be at Kanker Palace. After breakfast drive to Raipur visiting few villages on the way. Then spend some time at Champaran and Rajim Lochan temple. Then check into the hotel and overnight at Raipur. After breakfast drive to Raipur airport for onward journey.